Priceless! Amber’s Fertility Awareness Method class series changed my life. I say this with no exaggeration. The knowledge she shared was completely new information to me, and I come from a pretty standard college-educated family. I learned things about the female body that I never knew were possible. You CAN be in control, you CAN know your body, and CAN be in touch with nature of your cycles and your fertility. Yes, this is perfect for women who do NOT want to get pregnant, as well as women, who are trying to conceive. Once you learn what happens to your body during the cycle you can use the knowledge in any way YOU need! The class is 100% personalized in that. This method is crucial for everyone to know, but a great teacher is what makes it stick. The amount of personal attention each of the students received in the class was remarkable. Every question was answered (and you WILL have questions!). Wonderful handouts and supplementary materials were provided - those I will keep for the rest of my life. Once you learn how to chart with Amber’s help, it is easy to continue using the method on your own. This is the most incredible investment. Purchase of a lifetime, I would like to say. If you have a uterus, Amber has some magic to share with you! I recently had the pleasure of attending her Fertility Awareness Method (FAM) class series and it was incredible. Amber gives you all the information you need to feel confident charting your cycles so you truly know your body, when your fertile and when you are not and how to use this safe and effective form of birth control. I had been on hormonal birth control for years and wanted to stop putting chemical hormones in my body (which effectively shut off your natural hormones and your womanhood!) and FAM was the answer. I read Taking Charge of Your Fertility, which got me started, but didn’t give me a thorough understanding of how fertility works and how to most effectively chart during my cycle. Amber gave me the tools I needed to do just that. Even if you are not planning to use Fertility Awareness Method for birth control, gaining a deep understanding of how your body and fertility functions in not only empowering but extremely important and fascinating. This should just be basic information that we all grow up knowing as women! I can’t believe it took me until my late twenties to figure it all out. And if you are trying to get pregnant, Amber teaches FAM for conception as well! She also offers Maya Abdominal Massage which I have really enjoyed! For the maya abdominal massage has played a big role in getting my very irregular cycles more regular! Yay! I participated in Amber’s first ever Fertility Awareness Method class at Natural Recourses. I’ve been charting my cycles for several months and thought I had a pretty solid grasp of the fundamentals, until I met Amber! She provided a wealth of new information and knowledge that comes only with experience, deep education, and clear love of the subject matter. I’ve been going to see Amber for over a year now—I was referred to her for fertility massage, but by the time I got around to seeing her, it was just as I was going through a miscarriage. She was caring and kind, and supplied me w/ information on how to take care of body during this time. She introduced me to the world of steams, and supplied me w/ information and bodywork to help my body recover. From that point on, she and I worked on overall wellness, not just through her amazing abdominal massages but also via her guidance and insights about the entire holistic picture—from diet, to fertility preparation, to emotional health. She’s also introduced me to two other wellness practitioners that I can honestly say have made life-changingly positive impacts on my life. And through this all, I’ve been continuing to go to Amber for the incredible massage work. How many stars would you give to a person who hand held you through one of the most difficult, intense, and mind blowing experiences of your life? Too bad Yelp maxes you out at only five. I knew I wanted Amber to be my doula right away, it was amazing how much at ease I felt knowing she’ll be there when I need her. Months later I called Amber in a panic at 40+ weeks pregnant after my doctor mentioned induction for the first time. I always envisioned having an all natural birth and staying at home for as long as possible before transferring to a hospital, so the mention of pitocin really scared the s..t out of me. Amber calmed me down and offered to give me her magical Mayan massage. I started feeling contractions on my way home from her massage and was in full labor just hours after. Through the whole labor Amber’s voice was the thin line connecting me to the reality and telling me I’m doing great. Every time I opened my eyes Amber was there, always knowing when to reassure me, when to push me, and when to keep quiet. My husband was there, ready to support me and do everything he could to help, but you really need someone with experience to guide you through l&d. Husbands cannot replace doulas!!! And if all of that was not enough Amber manages to take amazing pictures of the baby’s arrival and of our first moments together as a family of three. I get to relieve that experience every time I look at the pictures now. The moment we met Amber we clicked. She has a sweet, fun loving, and yet thoughtful personality and is very committed to her work. We found her very reassuring, and her gentle encouragement helped us to build our confidence in the lead-up to the birth. At the birth itself Amber was amazing. Pierre was very keen to be as involved as he could be and Amber totally respected this - standing back when she saw that we were managing, stepping in when she could help. It was an awesome birth team. The midwife at St Luke’s who attended our birth, who had over 16 years of experience, was very impressed with how Amber worked and supported us. I can only say that Amber was like a sister to me - always by my side, wiping my brow, anticipating my every need. She was our guide - someone we trusted completely. Her wisdom and strength helped us get over some rough terrain. I feel very blessed to have met Amber and have had the opportunity to work with her. Amber is a wealth of information, knowledge, experience and encouragement. My husband and I agree that she was an integral and invaluable part of my 31 hour home birth. During labor she knew exactly what foods and drinks to provide, and suggested positions to make me feel as comfortable as possible. Her words of encouragement and visualization moved me past the toughest part of labor and helped me birth my little girl. When my wife recommended a doula I thought, ‘You’ll have me, why would we need someone else to help you labor?’ But, I agreed and we hired Amber Dawn. Amber Dawn’s knowledge and calming presence shifted our labor from an event to be endured to an event we could engage in to support a healthy delivery for baby and mama. From recommending intelligent, beneficial laboring positions that reduced pain and encouraged proper position of our baby, to adopting an encouraging and confident attitude that became contagious and empowering for me, Amber Dawn’s service was fantastic. Amber is an awesome doula. Amber was originally our backup doula. We had met with her a liked her a lot, but went with another doula. But when the day came for our baby to come out, our primary doula was at another birth, (blame the full moon) so Amber came to our side to help. We originally went with another doula because we felt Amber was more towards the ‘Feeling’ end of the ‘Thinking/Feeling’ spectrum. My wife an I tend to be pretty analytical and wanted a doula who could address our (my) concerns in early pregnancy. What should have been obvious: Childbirth is not a /thinking/ exercise. Amber was an incredible calming and strengthening presence during my wife’s labor. She always seemed to have the perfect thing to say to help my wife through a contraction wave. She also kept up with me to let me know what was coming and make sure that I was ready for next steps. She made great suggestions for positions and things to try as we progressed. While we had a few complications, we were able to have the natural childbirth we had hoped for. I think we had a pretty easy labor, but it was great to have Amber at our side to help us through it. When my wife first said “I want a Doula” I was confused and a little insulted. We were 7 weeks through a 12 week class on the Bradley Method (natural childbirth) and I was feeling like I could deliver our baby on my own in my living room... if given the chance. After some discussion I decided that it wouldn’t hurt to do some interviews since my wife felt a doula was something that would be of great support to our process. When we met Amber we both felt an immediate connection and trust in her ability to take both of us through the birth process. We chose her as our doula and continued to experience her care and confidence in her work during all of our following conversations. Amber was very helpful when choosing certain aspects of our birth plan, giving pros and cons of each decision to be made and conveying a sense of support regardless of what path we would have chosen. Our laboring experience took a few turns that we were not originally expecting. My wife ended up needing to be induced at the hospital which was very different from our plan to labor at home for as long as possible. We were in the hospital for 36 hours prior to active labor...during which time there were multiple decisions that needed to be made. Although we didn’t need Amber to physically be with us... she helped us make several decisions regarding the induction process via the phone over the 36 hour time period. It was extremely helpful to have her knowledge and support during a time when there were so many decisions to be made that we had not prepared for. Amber showed up at the hospital shortly after we called for more physical support and immediately got to work helping my wife and I. She utilized various techniques (positioning, massage, water etc.) to make contractions as productive as possible while also helping to alleviative the pain. Amber and I worked as a team to support my wife and at the end of the day we had an all natural labor and delivery. I can honestly say that I don’t think we would have had such a positive experience without her. Even though we had learned many of the techniques she was using...her experience was invaluable. It was an amazing feeling to know that we had the natural childbirth experience that we had wanted even though we had come up against some things that were unexpected. I couldn’t help but feel that we had just had a visit from this birthing super woman who swooped in, saved the day and flew off to go and help others! I interviewed a number of doulas before choosing Amber. I found her very grounding from our first meeting and my husband and I were both impressed and comforted by Amber’s extensive experience. I knew that she would be able to handle (and help me handle) whatever my birth turned out to be. And we could not have been more right. Our birth experience veered from our ideal scenario almost immediately and Amber offered us guidance to adapt while knowing when to let us make decisions on our own. Despite needing to change some of our expectations around what the birth would be like, I labored and delivered without an epidural, which was something I really wanted to do. I can say with certainty that this never would have been possible without Amber. When I was close to giving up, she would simply say “Can we try —- first” and I always felt like I could. Her sense of what I needed was almost always right. I also credit Amber with helping to create an environment where my husband and I could maintain a deep and positive connection throughout the birth experience. It was wonderful to have Amber with us immediately after our son was born to help us get started with breast feeding and feel like we still had support after the crescendo of birth had passed. I will never forget how delicious and nourishing the Odwalla Superfood she gave me tasted when I was so spent. I whole heartedly recommend hiring Amber Hallet as your doula. Amber helped us deliver our first child, a healthy little girl named Macie, and we would have been lost without her. When I went into labor, we called our doula and found out that she was already at another delivery and would not be able to attend our delivery! Yikes! She assured us that she would find an amazing doula to help us through the labor. But as you can imagine, I was pretty concerned about who would be joining us for the birth. Little did I realize that this was fate stepping in to help me have a healthy delivery. 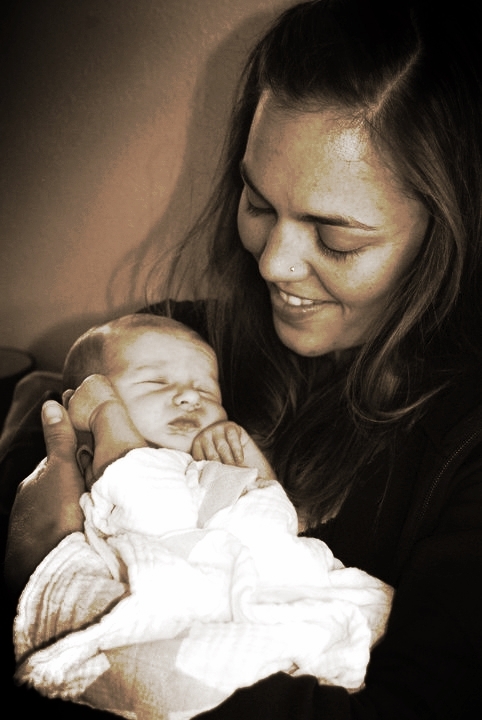 We are SO thankful that we had Amber at the delivery as she was a much better fit than our original doula. Amber arrived in our hospital room, and I immediately felt at ease with her. In her calm and gentle way, she was able to make me more comfortable, reassure my husband, and to create a warmer atmosphere in the room. My husband is actually a physician who has spent years working in hospitals and has even assisted in the delivery of a few babies. Since this was our first child, we did not know exactly WHY we needed a doula, but we were confident that it would help make the situation an easier experience for everyone. And in case you are still wondering - YES, you need a doula! Doula’s are there primarily for the mothers, however, they are also indispensable to the fathers. Amber made sure that my husband knew how to support me throughout the process and could interpret some of the subtler twists and turns of labor (of which there are many). My husband was originally a skeptic about hiring a doula and now is a firm believer. He even strongly recommends hiring a doula to any patient that asks these days. Amber’s background in body work meant that she was able to provide massage and pressure in just the right place during the labor which makes such a huge difference. She was great with the hospital staff - always respectful and courteous while being persistent on those issues of importance. While Amber has a calm presence, she is also very strong when the time comes. Amber coached me through 3 hours of pushing using both encouraging words as well as providing instruction for how and when to push. She made sure that I had enough fluids and sugars to keep me going, reacted quickly if I needed to move or adjust and made sure that my husband knew exactly how he could help. My little one was actually not descending in an ideal position. She was slightly posterior which meant that I was not dilating and was experiencing painful back labor. Since I was not dilating after 14 hours of labor, I was started on ptosin and an epidural to help labor progress. This was the moment when Amber’s wealth of experience played an integral role in the safe delivery of my little girl. Amber is experienced in the practice of turning babies during labor (this is something few doulas and even midwives practice) and this knowledge was the key to my safe delivery. Amber and my husband (with Amber’s direction) performed some simple maneuvers to encourage the baby’s head to descend into the correct position above my cervix. We believe that these maneuvers shifted the baby’s head into the right position as I started dilating more rapidly, my contraction pattern normalized, and ultimately Macie was born in an anterior position (the correct position). Amber was also great a repositioning me during the entire length of labor to encourage the baby to rotate. With these simple techniques, we believe that Amber saved me from having to get a c-section. AMAZING! As I sit down to write a testimonial for Amber, one month after the birth of our beautiful daughter, I find myself searching the memory banks to recall a passage from the Bhagavad Gita (a Hindu scripture) that I heard in a yoga class earlier this year. The exact words escape me so I shall paraphrase as follows, “The highest good that one can achieve is to do the work that comes naturally.” Amber is the living embodiment of this ideal. She was born to help bring babies into the world. As my wife’s pregnancy progressed and we started to think about the preferred birthing experience for our first child, it became clear that we wanted to find a doula to assist us with the process. We asked friends and colleagues for recommendations and wound up at a Meet-the-Doulas event at Natural Resources where we met a number of warm, professional, experienced women who could have filled the role capably. We were drawn to Amber from among the large group for a number of reasons: she has an incredibly calm presence, a wealth of experience delivering babies in all sorts of circumstances, and a strong background as a ballet dancer and body-worker that has given her great insight into the mechanics of the female body. Ultimately, what we found in Amber was not an assistant but a partner in the truest sense of the word. She became the crucial third member of our team, and in our pre-partum meetings her presence put us at ease as she helped to educate us about our choices and to plan for the birth. In all of our interactions it felt as if we were dealing with an old friend that we had known all of our lives, a friend that was meant to be there for us at this important stage in our journey. When my wife finally went into labor, ten days after her due date, Amber was there for us at every moment of the nearly 40-hour process. From our initial phone calls in the middle of the night to answer our questions and assuage our concerns as labor began, to lovingly holding our just-born baby girl, Amber was the consummate caring, compassionate professional every step of the way. While my wife labored at home Amber was there to help her with positioning, to offer hands-on bodywork, to draw a bath and pour warm water over her as she sat in the tub, to make a smoothie, and seemingly to do anything that either of us could have wanted. While my wife’s labor was clearly long and difficult, she and I both view it as very much of a positive experience, due in no small part to Amber’s incredible presence throughout. I can confidently say that Amber made a huge difference in our birth story, and that it would have been much more difficult for us without her help. My husband and i are so happy we were able to work with Amber for the birth of our daughter. It is a strange idea to share the most intimate moment of your life with a virtual stranger, but it did not feel that way—Amber feels like a trusted friend. Not many things went according to my birth plan on the big day, and it was such a comfort to know that Amber was there as we had planned. She was also a huge help and support to my husband—giving him advice on how to best support me, and also reminding him to eat!